I want to thank you for reading my blog. 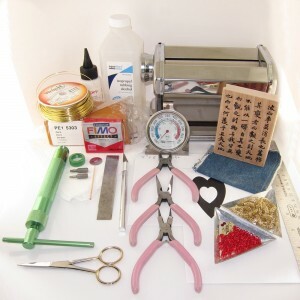 And in order to do that, I want to give you a present – a free tutorial. 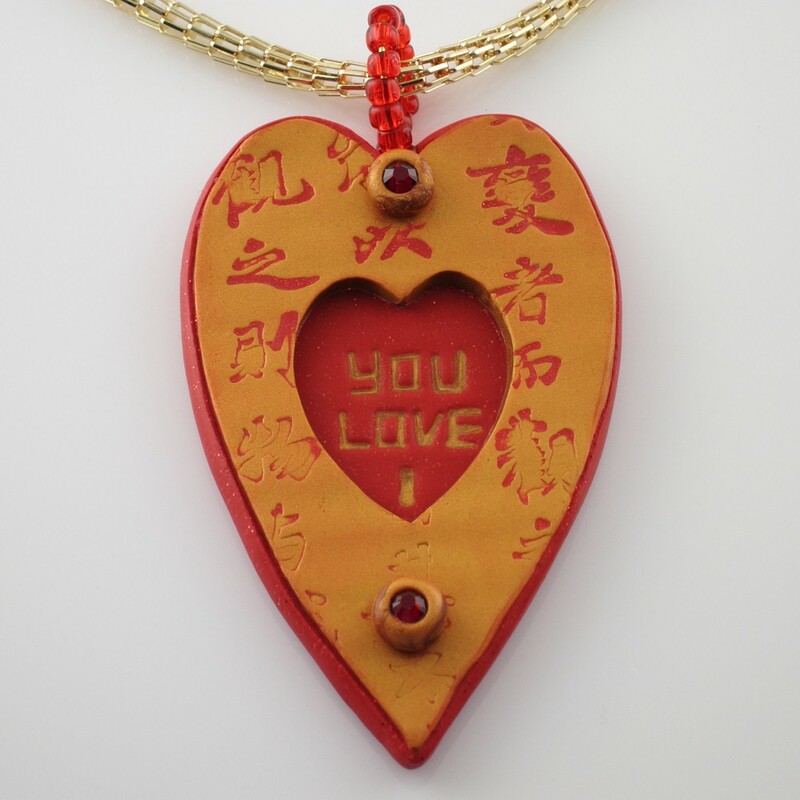 Using this tutorial, you will be able to make a beautiful oriental style pendant for Valentine’s Day. Give it to someone dear. Or to yourself. Please, do not distribute this tutorial. I will be selling the full version of it in our online stores for $7. But you can get it for free. Because you read my blog. Thank you. Working off the spool, string 14 seed beads onto the wire. 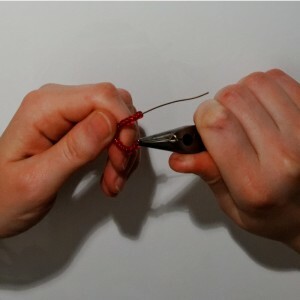 Using round nose pliers, make a temporary wire loop at the end of the wire, to prevent your beads from sliding off the wire. Move seed beads to the loop. Cut the wire off the spool 3” (7.6 cm) away from the beads. Form the wire with beads into a large loop. Move the beads to the center of the loop. 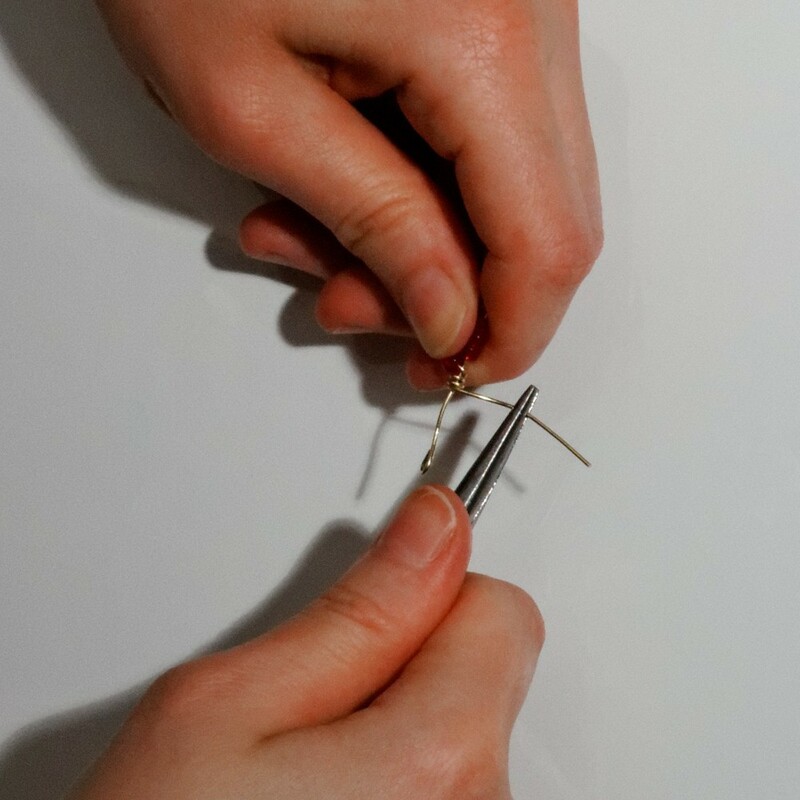 Grasp the wire about 1” (2.5 cm) away from the temporary wire loop with your chain nose pliers and make a bend in it, forming a straight wire stem. Wrap longer wire tail around the stem for a few times. Trim the wire off and tuck in the end. Using wire cutters, cut the temporary loop off. Form a small simple loop at the end of the wire. Adjust the loop as necessary. Set the bail aside. 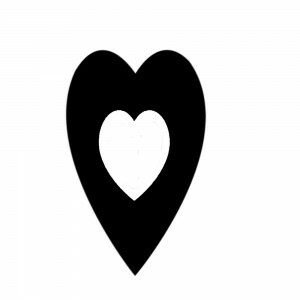 Print the heart template at 4″x6″ size. 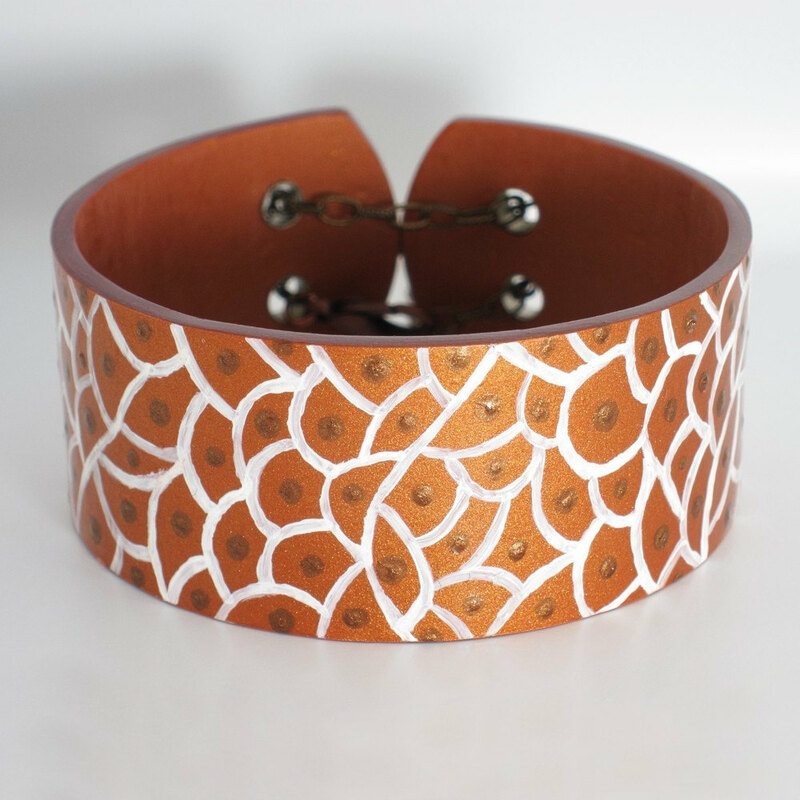 Using a pair of scissors, cut the template out. Cut the white center out of template. Condition gold-colored clay and then red-colored clay. Roll both gold and red clay out on the first largest setting of your pasta machine or by hand to the 3 mm thickness. Lay gold-colored clay on a piece of white typing paper. Spray a letters rubber stamp (I used Chinese calligraphy stamp) with water and stamp the clay. Dry the water off the clay with a piece of paper towel. Place the heart template over the impressed clay and cut the heart out using a craft knife. Following the template outline, cut the center heart out. Smooth the edges of the inside cutout using your finger and/or toothpick. 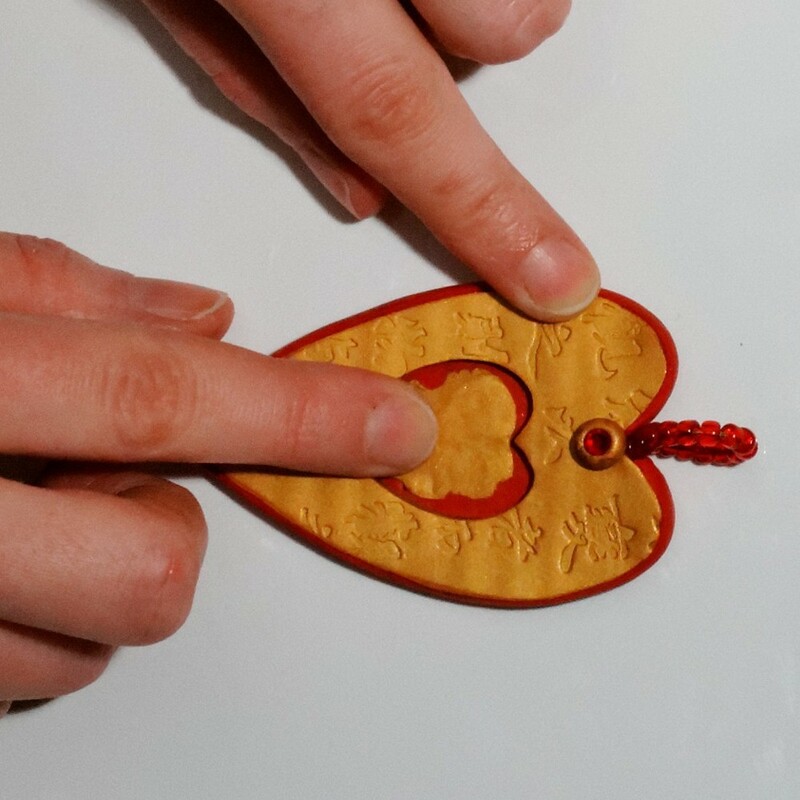 Put the gold clay heart on a piece of paper. 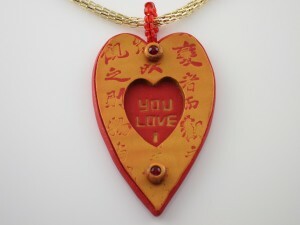 Lay the template on red clay and also cut the heart shape out, but this time don’t cut out the center heart. Put the red clay heart on a piece of paper. 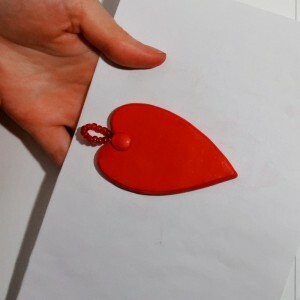 Place the seed beads and wire bail onto the red clay heart with small loop inside the heart shape and lightly press on the loop using a toothpick. Don’t press so hard as they go through the shape. Apply a very thin line of liquid clay inside the perimeter of the red heart shape, about 1/8” (0.3 cm) away from the edge and on the exposed parts of wire loop and wraps of the bail. 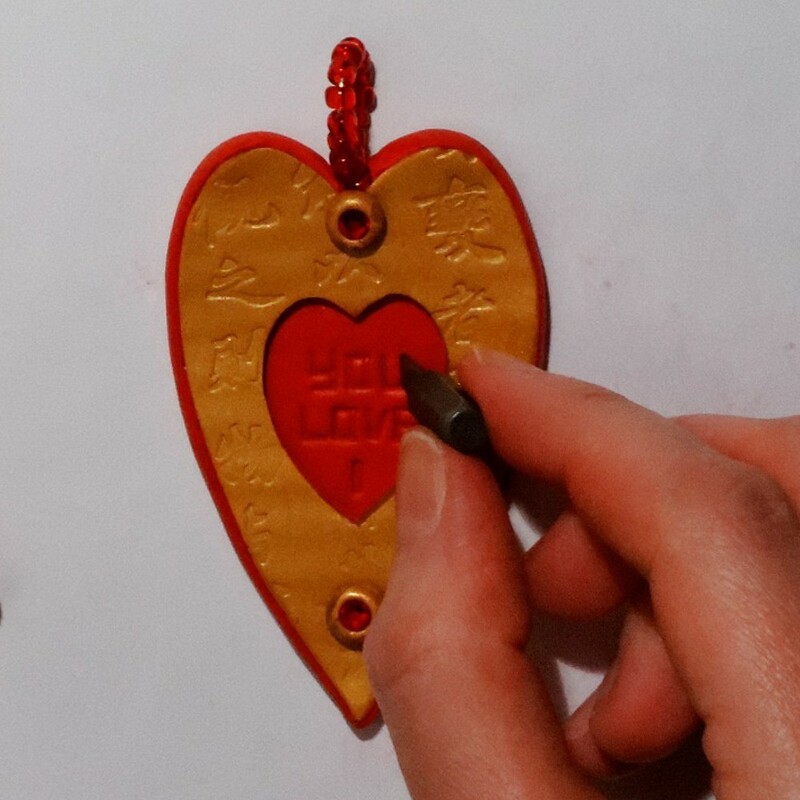 Using your forefinger carefully spread the liquid clay towards the edges of the shape into a thin layer. Lay gold clay heart shape on top of the red shape. Pick the pendant up and go over the edges of it with your forefinger, aligning the shapes and smoothing the edges. Roll out a ball of very well-conditioned red clay size of a large grape. Roll that ball into a thick short snake size of the inside of your clay extruder barrel. Load the clay snake into the barrel, place small rectangular slot disk (disk # 11 of Makin’s clay extruder) into the extruder cap, close the cap and extrude a red clay ribbon. Trim the end of the clay ribbon flash with clay blade. 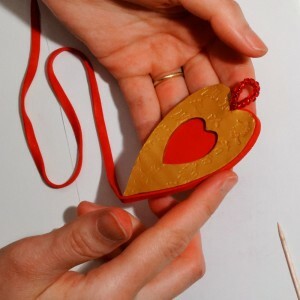 Apply the ribbon around the heart pendant, starting at the center groove of the heart and positioning the ribbon in the middle of the sides. Burnish the applied ribbon with your finger, bringing it close to the edges of the pendant, just like bezel setting a stone. Roll out a ball of red clay size of a small pea. Flatten it between your thumb and forefinger to get a round shape. Turn the pendant over and apply the round shape to the back of it, right below the bail. Press on it lightly with your finger to make sure it adheres. Roll out two balls of gold clay each size of a peppercorn. Apply them to the front of the pendant, one right below the bail and another in the middle of the bottom section of the heart. Using the blunt end of a toothpick, make small indentations in the middle of each clay ball. 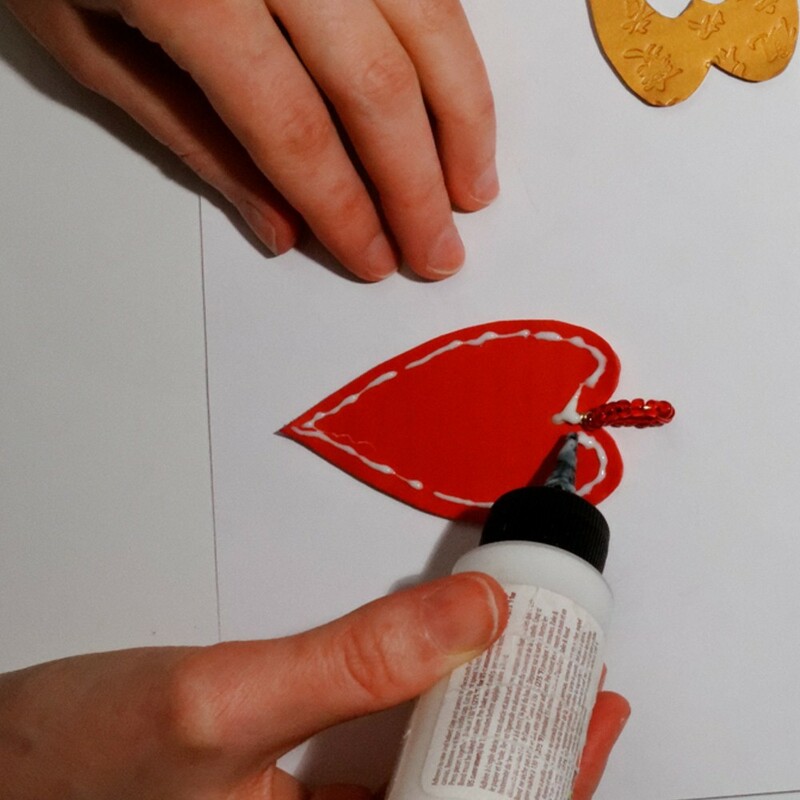 Apply a tiny drop of liquid clay to the indentations. Place a 3.9 mm Swarovski Crystal rhinestone on top an indentation in the clay ball and press on it with the blunt end of a toothpick to slightly embed it into clay. Repeat with the other clay ball. 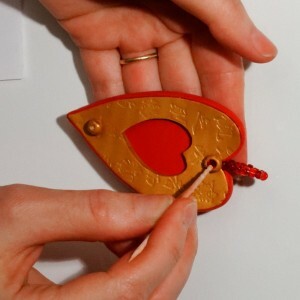 Using screwdriver tips, impress the “I love you” writing into the center red heart. Start with the “I” at the bottom of the heart and proceed up, trying to space word lines evenly. Place on a piece of paper and ceramic tile and bake in the preheated oven at 270 F (130 C) for 30 minutes. Let cool completely. 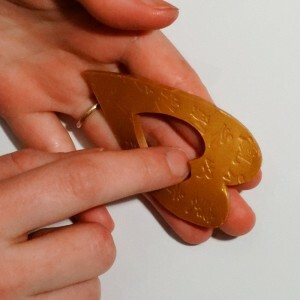 Do backfilling of the letters on pendant. Take a small piece of a very well-conditioned gold clay and press it into the center red heart. 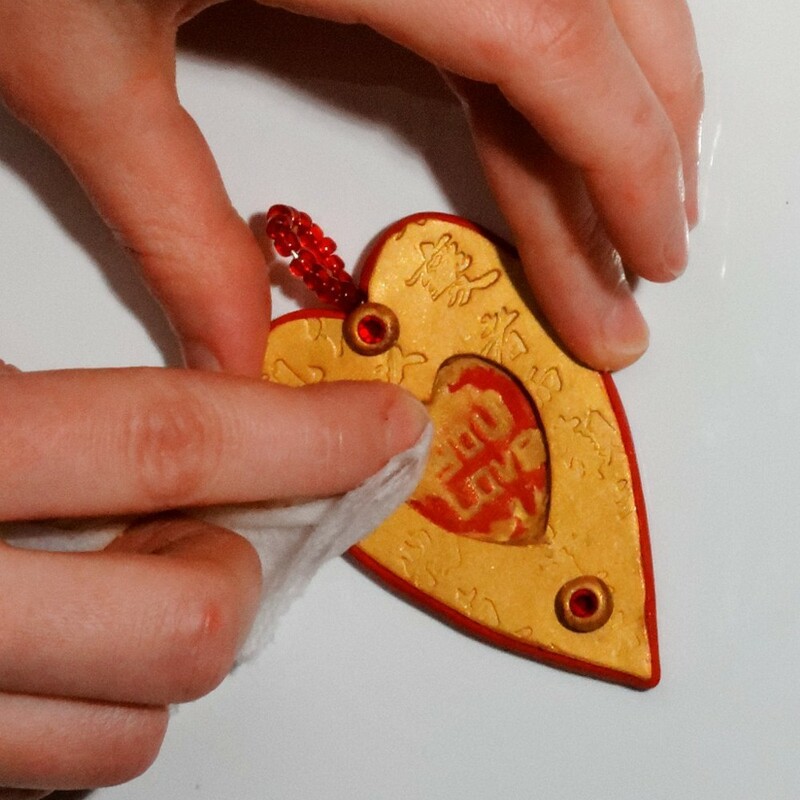 Spread the gold clay all over the red heart in a thin layer, like butter, while pressing down firmly. Fold a piece of paper towel in half and moisten it with rubbing alcohol. Start wiping the excess clay off the red heart. Keep wiping until the clay is all gone from the surface and only left in recesses, which are your “I love you” letters. Fold a piece of dry paper towel in half and remove excess rubbing alcohol, as well as white alcohol residue from the clay, polishing up your backfilled letters. Repeat with red clay backfill applied to the gold heart. Check the sides and the back of the pendant to make sure no lumps of red clay got stuck to them. Bake in the preheated oven at 270 F (130 C) for 20 minutes. Let cool completely. Pick up your buffing cloth (aka a piece of your old jeans) and buff the cooled pendant, rubbing the cloth on the front, back and sides of it to bring out the beautiful shine. Great and creative! I especially love the backfilled letters and their contrast to the rest of the piece. Thank you! Backfilling technique IS a lot of fun! 🙂 I love it. You can do all kinds of colors with it.